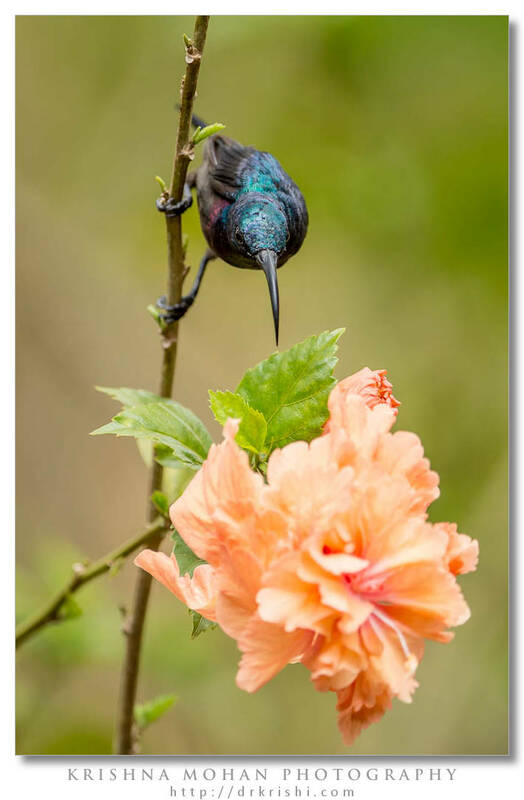 I found this male Loten’s Sunbird in my garden feeding on nectar from double orange hibiscus(Hibiscus rosa-sinensis) flower. I photographed it using Canon EOS 5D Mark III using Canon EF 300mm f/2.8L IS USM combined with Canon EF 1.4x III Extender. All the photos were shot handheld at 1/640th of second shutter speed at f/4.0 aperture. Bird was in close proximity and as it was quite familiar with my presence gave me a great pose. If I had used smaller aperture I would have got the flower in the foreground and the bird also in full focus. But I also would have got the cluttered branches the background. I used the largest aperture available with my lens & TC combo (f/4.0) as the hibiscus plant was quite overcrowded with branches and I wanted to throw all those other branches in the background out of focus. Large telephoto range I had also helped me to get the background blur I wanted. 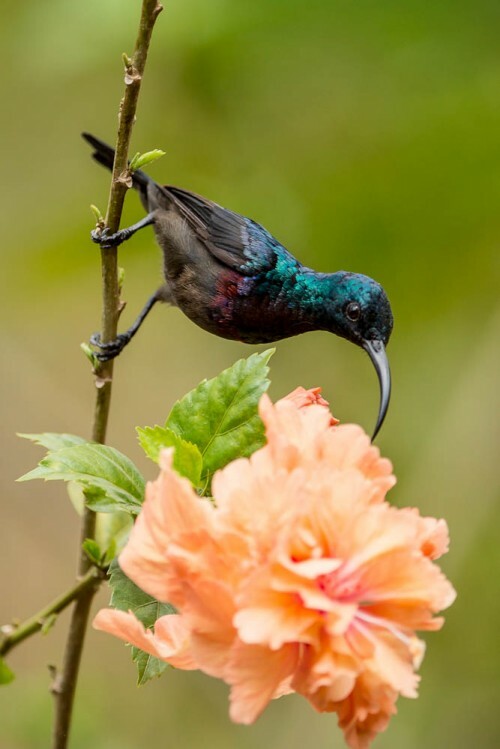 The Loten’s Sunbird or otherwise known as Long-billed Sunbird, Cinnyris lotenius is one of a group of very small sunbird which feed largely on nectar. 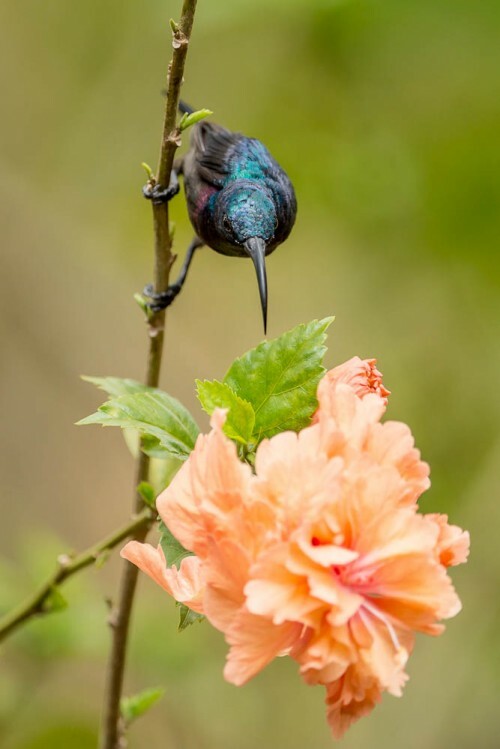 Sunbirds will also take insects, especially when feeding young and Loten’s Sunbird is possibly more insectivorous than other sunbird species. Their flight is fast and direct on their short wings. 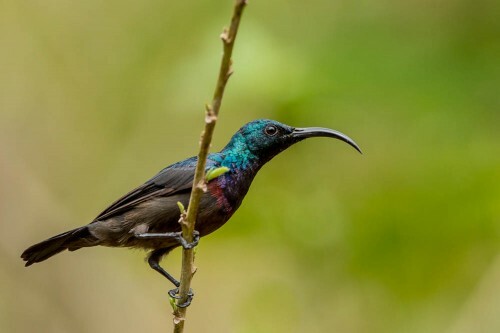 Long bill separates this from the more common Purple Sunbird (Cinnyris asiaticus). The wings are browner and the maroon breast band is visible on the male under good lighting. The call is distinctive and they are also very active often bobbing their head while foraging. 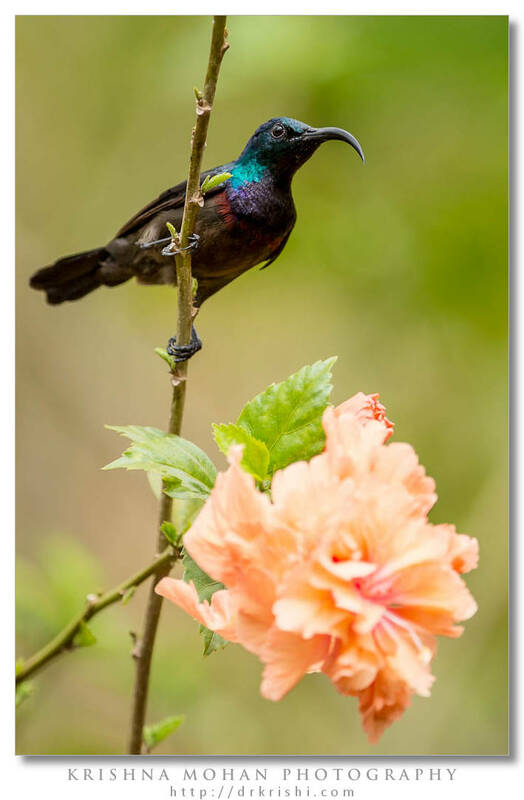 Loten’s Sunbird is found only in peninsular India and Sri Lanka. The main region is along the Western Ghats and into the southern peninsula. There are scattered records from central India and into the northern Eastern Ghats near Orissa. Race hindustanicus is found in India while the nominate race is found in Sri Lanka. The song of the male is a long repeated wue-wue-wue… with the last notes accelerated. The males may sing from the tops of bare trees or telegraph wires. 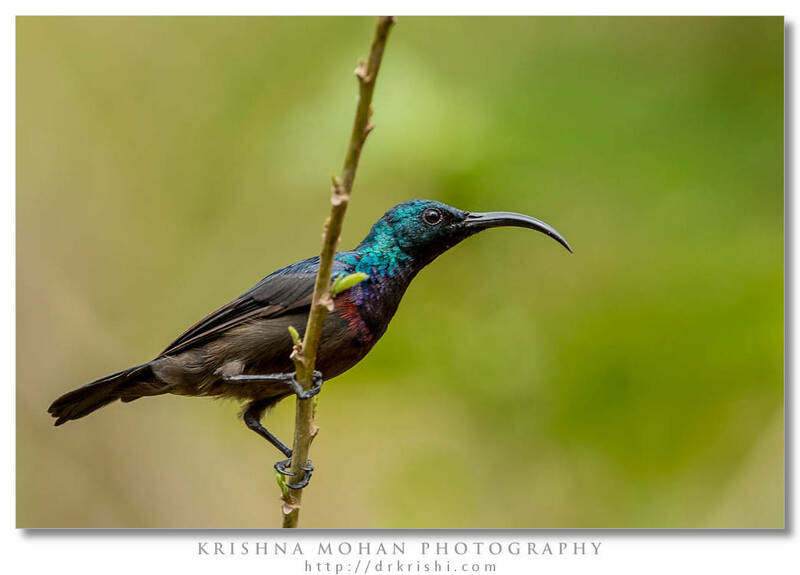 Loten’s Sunbird is a resident breeder that is locally common in forest and cultivation in south India and Sri Lanka. Two eggs are laid in a suspended nest in a tree. The bag of webs, bark and caterpillar frass. Salim Ali notes that the species is exceptional among Indian sunbirds in not having cobwebs on the exterior. 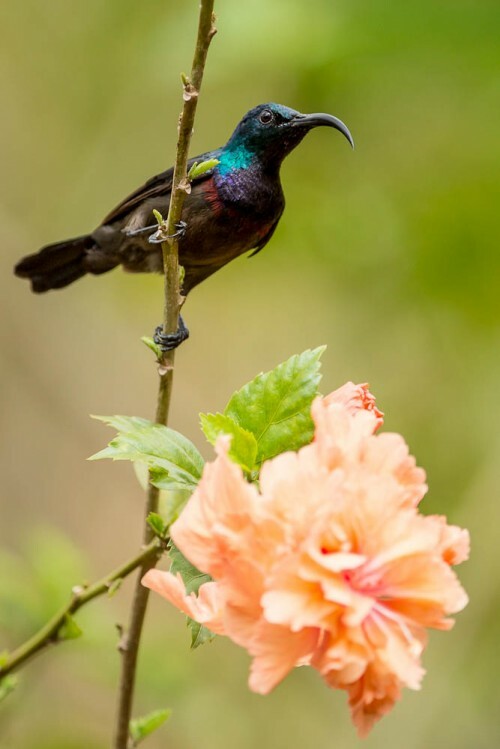 Loten’s Sunbirds are small, only 12-13 cm long. They have long down-curved bills and brush-tipped tubular tongues, both adaptations to their nectar feeding. The bill lengths vary across populations with long bills found in Sri Lanka. The adult male is mainly glossy purple with a grey-brown belly. 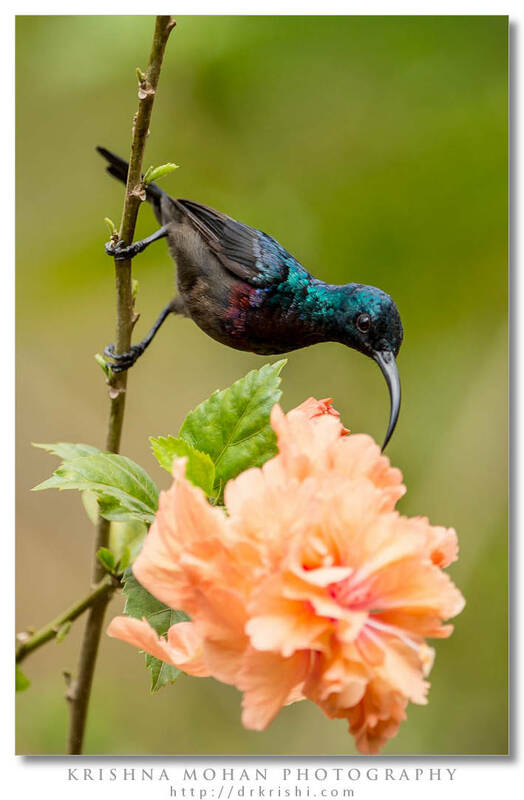 It is similar to Purple Sunbird, but is larger, has a longer sickle-shaped bill, and a different belly colour. The eclipse male has yellow-grey upperparts, darker than Purple Sunbird, and a yellow breast with a blue central streak extending to the belly. The female has yellow-grey upperparts and yellowish underparts, but lacks Purple’s faint supercilium. The call is a buzzy zwick zwick. EXIF info - Aperture : ƒ/4 | Camera : Canon EOS 5D Mark III | Taken : 8 April, 2012 | Flash fired : no | Focal length : 420mm | ISO : 250 | Location : 13° 4.0238′ 0″ N 74° 59.7333′ 0″ E | Shutter speed : 1/640s | Images and content Copyright © Krishna Mohan. Please contact me to purchase prints or for image publication license. Thanks.These are great pictures of an extraordinarily gorgeous bird. One must use binoculars to appreciate the colours. Without magnification, they appear ordinary. A pair is building a nest at my place in Delhi NCR. Any food I can place for them?